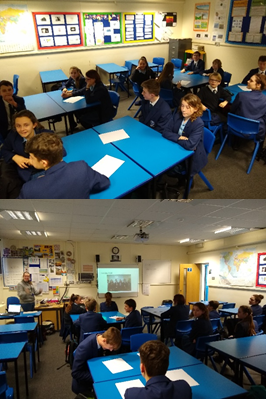 This term, we have continued to focus on ensuring that the Year 7-9 Tutor Rep meetings provide an opportunity for valuable and constructive discussions. Our Year 10 Student Voice Leaders have led these meetings and students are given an opportunity to gather feedback from their tutor groups beforehand and a chance to give feedback to them afterwards. Our main aim is to ensure that all students feel they have a voice, even if they have not been selected as a Tutor Rep. The recent meetings have resulted in a range of ideas, some of which were raised in all three year groups and these ideas are now with the Senior Leadership Team for consideration. Ideas include a range of suggestions for lunchtime and after-school clubs and more vegetarian options in the school canteen. Students also hope that the quality of the water fountains can be improved and have some fund-raising ideas to help make this happen. Meanwhile, at the time of writing we are preparing to meet with the School Council from Highcliffe School next half term to compare ideas and share ways of working together. To make this more effective, a group of around twelve Senior Tutor Reps has been specially selected from the Year 7-9 teams. These are students whose contributions during the main Tutor Rep meetings have demonstrated their commitment and dedication to the role. The photos opposite show this group during a planning meeting last week – they were thinking about what they are most proud of at Twynham School but also thinking of questions to ask the Highcliffe students about their school. We look forward to this meeting and will report back in due course. As always, if you have any great ideas of how you (with our help) could make Twynham School even better – let us know. Email us – studentvoice@twynhamschool.com.